Boneset plant, Eupatorium perfoliatum. Tea of the leaves and flowering tops used to treat colds and flu – seems to enhance the immune system. Flowering tops produce a showy garden display – white flowers are long lasting. 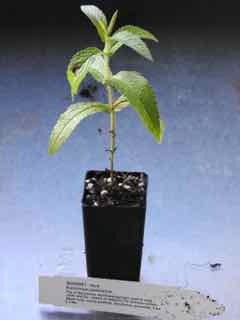 Boneset plant is native to eastern and central North America and prefers moist soils in a protected sunny position. Frost resistant but drought tender. A deciduous, perennial plant, growing to 1.5m x 1.0m. Large heads of white flowers occur during summer. Be the first to review “Boneset, plant” Click here to cancel reply.